Come home to Pacific Highlands Ranch! Become a part of a community! 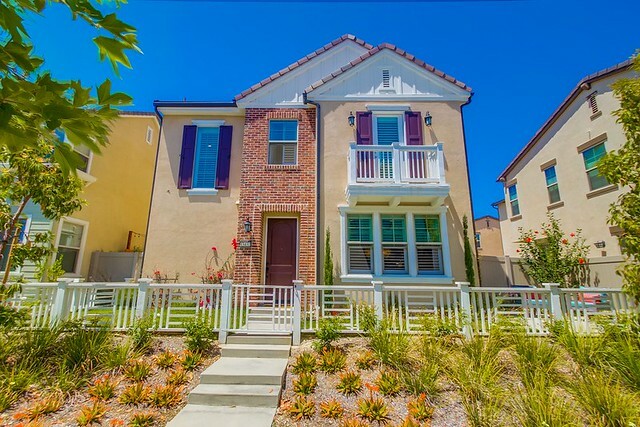 Fall in love with this 2 year NEW light and bright home. No detail has been left behind in this well cared for property. Not only did the sellers choose the best of the best in builder upgrades like GE Cafe Series kitchen appliances, a stainless steel farm sink, Ceasarstone counter tops with custom tile backsplash, White Maple shaker cabinets and drawers with soft close mechanics, recessed lighting throughout, J Box's in each room (except kitchen), and the contemporary hybrid laminate flooring. The Owner has contributed to the style of the home with the addition of elegant West Elm lighting, white vinyl Plantation style shutters on every window, a fenced and enclosed front yard with low maintenance landscaping and finished slab that create a peaceful space, and a complete backyard with decorative wood walls and Bistro lighting that make a great space to entertain or just relax! Upon entering the home it surely feels like a model home. The openness of the great room along with the top of the line finishings will lure you in. Do not miss the tucked away guest half bath before you head upstairs. Once you travel to the top of the staircase you will notice the many storage options with built-ins along the hall in strategic places and a laundry room with lower cabinets as well as uppers. The utility sink in the laundry room is sure to come in handy along with the counter top space. As you turn the corner into the master bedroom you will notice the Juliet Balcony, great to let in a little breeze on a warm day. The master bath has dual sinks and an abundance of counter space. The deep soaking tub and separate shower are a perfect combo. Don't forget about the large walk-in closet! Coming out of the master and continuing down the hallway you will meet a bedroom on the left. This room has custom paint and a walk-in closet. You will find a built-in office style desk that connects you to the next bedroom and to the right you will see the homes second full bath that accommodates dual sinks and a separated shower area. The home also provides a Tankless water heater, available gas BBQ stub, and attached garage storage that will all enhance your living experience! As if this home on Dayflower isn't enough, The Ivy and Elms community provides large grassy open spaces and community walking paths. Hiking and biking trails are close by in a 1,300-acre natural preserve. The nearby Village retail complex offers a world of opportunity for shopping, dining and entertainment. Also, Parents will appreciate being able to send their students to the outstanding schools of the San Dieguito and Del Mar Union Unified School District. Don't forget you will also be just five miles from the Pacific Ocean. Welcome Home! With over 3 years of Real Estate experience and 20 years in customer service, Anzlee brings a fresh outlook and an abundance of client care to each transaction! Spending many years in the service industry, she is uncommonly focused on the individual and will assist you every step of the way. Anzlee is an agent that listens and understands you!